The Cuisinart CPT-180 four-slice toaster features 1-1/2-inch wide slots that automatically adjust to accommodate bagels, muffins, and thick slices of homemade bread. The unit's simple touchpad controls provide cancel, reheat, defrost, and bagel settings, while its browning control dial offers six options from light to dark. The CPT-180 include handy LED indicator lights, a high-rise carriage for removing smaller-size items, a slide-out crumb tray, and a convenient cord wrap to help keep countertops tidy. It has a smooth brushed stainless housing with polished chrome and black accents. The Cuisinart Brushed Crome 4 Slice Toaster Nic has many exciting features for users of all types. You can extend the lifetime of your Cuisinart Brushed Crome 4 Slice Toaster Nic with the purchase of a FactoryOutletStore Factory Protection Plan. See the Cuisinart Brushed Crome 4 Slice Toaster Nic gallery images above for more product views. 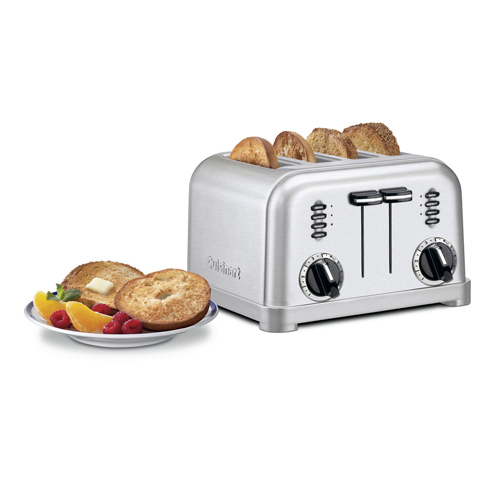 The Cuisinart Brushed Crome 4 Slice Toaster Nic is sold as a Brand New Unopened Item.